We've decided to become an official "Rebel Recruiter" for Hyperspace memberships. Maybe you've heard Starwars.com is having a bit of a contest designed to get Hyperspace renewals and new members. We like this idea and have decided to have a bit of fun with it. We need your help. 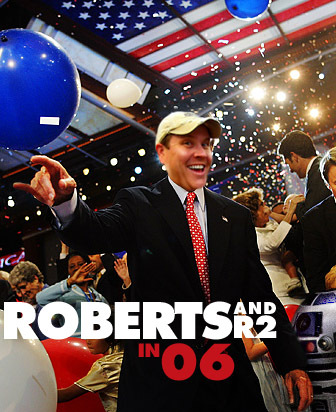 Rebelscum.com has decided to toss our man Dustin Roberts into the race for the official Star Wars Fan Club President. This title is a benefit he'll get if he has the most Hyperspace membership referrals! We can't imagine a better fan for the job. Dustin L. Roberts is a man with a vision. A man with a dream. A man not afraid to wear an R2 beanie. "As President of the Star Wars Fan Club, I will not take my duties lightly. I'll wake up each morning in my Jar Jar Jammies and ask myself, "What can I do for Star Wars today?" When confronted with difficult Fan Club Presidential decisions, I will not rush into it head strong like an ignorant wookiee. Nay, I will pause and consider, "What would Yoda do?" You may be asking yourself -- Who is Dustin Roberts? Well, I have a famous sister, but that hasn't stopped me from attaining my own special vision for the future of our galactic way of life. I endorse the use of the Star Wars license on anything and everything. What do you want? Star Wars potato chips? You got it! Star Wars seat covers for your car? I'm all over that! Star Wars trash bags? What better way to organize your collectibles? If it can't be branded, I say it's of no use to me! In closing, my running mate R2-D2 and I have seen hard times but have always been able to reconcile our friendship with the greater goals of Star Wars being Forever. We are committed. Committed to providing the best Fan Club in this galaxy, or any other. Remember you are not just throwing your vote away. You're making a statement." The StarWars.com Hyperspace recruitment drive contest ends May 15th. When signing up as a new Hyperspace member, renewing or extending your membership, use this link to order. After purchase you will receive via email a Digital Access Code to use online to create or extend your subscription. The email you receive will have a link in it to the page on Starwars.com for managing your subscription. At that link, simply enter the Code and Dustin's email address "dustin@rebelscum.com" as the referral. That's it! You can help spread the word by grabbing a campaign banner and throwing it up on your website. Simply right-click and choose "save as" to download them to your desktop. 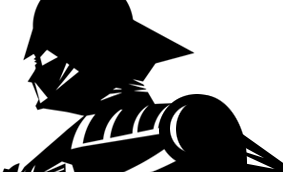 Then link the banner back up to the official DLR campaign headquarters (this page). No website? Use this limited-edition campaign avatar in the forum! Mr. Robert's first act as the Star Wars Fan Club Supreme Ruler President will be to run a special give away right here at Rebelscum.com! To celebrate the victory, we'll be giving away some Star Wars celebrity autographs from our friends at OfficialPix.com*. That not enough? Each winner will also receive a very special 8x10 glossy photo autographed by the man of the hour: Fan Club President Dustin Roberts! A treasure like that is certain to become your most prized family heirloom. Just our way of saying "thanks" to the community who supported our candidate. Dustin's been a boon to the Star Wars collecting community. You probably know him from his many years here at Rebelscum.com - heck, you might even recall his days over at Yakface.com. But did you know he's a past regional director of the Ohio Star Wars Collecting Club? Dustin is also the webmaster of R2D2Central.com, where his R2 fetish is readily apparent. Did you attend Celebration III? If you visited our booth, Dustin is probably the guy who handed you a free "Star Wars is Forever" pin. These days he's even been single handedly answering all the email and posting all the Star Wars news over at TheForce.net! A more dedicated and enthusiastic fan you won't easily find. What are you waiting for? Join or renew today! * Philip Wise, owner of Rebelscum.com is a partner in Officialpix.com. The following websites back Roberts & R2 in '06! Kerryearnhardtfans.com Star Wars y Mas!